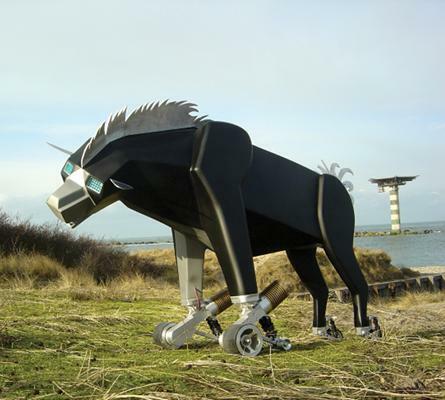 Baileybots stands for high quality kinetic sculptures made by Marco Kruyt. He grew into the field of kinetic art through his background as a Engineer - Model Maker. Gradually, through refinement and a growing set of instruments, he entered the fine arts field by working in the Antistrot collective. This led to experience in combining robotics with performance and 2D art, as well as widening the scope of the conceptual thinking behind Baileybots. Today, his work exhibits a distinctive connection with our surrounding nature and all its organisms. Baileybots’ organisms link numerical produced parts with handicraft. This process of linking is a key factor in Kruyt’s artistic practice. The urge to create life out of dead matter reminisces of alchemists and inventors of past times. It is this quality, combined with current production techniques, which makes his work so exciting and innovative. Bailybots reflects the view of the maker, his attitude towards the global ecological situation, and life. The use of scrap metal is a telling example. There are clear undercurrents in his work, commenting on the current relationship between man and animal.